What happens when your neighbors are winemakers and you decide to throw a great party? You’re hanging out with a few neighbors and you get to talking. Somebody mentions it might be fun to get everyone together and throw a block party. Hmm, this might be fun. So you pick a neighbor’s house with a pretty lawn and nice outdoor area with big shady trees to set up tables. Good start. Seventeen of your neighbors are winemakers, and they all agree to bring lots of wine to share. This is sounding better. Another neighbor is a chef that does magical things with tri-tip and barbequed oysters. And the neighbor down the street has a funk and soul band with a live horn section and a sound that makes you want to get out of your chair and start dancing. So you invite all the neighbors and a few more friends, and you all have great evening enjoying the wine, the food, the music, the conversation on a warm Paso Robles evening. It’s the best block party ever, right? That’s exactly what happens at the 46 West Wineries Association Summer Block Party in Paso Robles. And guess what? We’re all invited! The setting for the 2018 Summer Block Party on July 7 is Four Lanterns Winery. Owners and hosts Jackie and Steve Gleason named the winery for their four daughters—the lights of their life. A large barn, converted to the Four Lanterns Winery tasting room, is the centerpiece of the historic property and winery, which specializes in Rhone and Bordeaux varietals. The Block Party is designed to be casual, friendly, and laid back. And it’s purposely kept small to maintain that friendly feeling of a neighborhood party instead of a big wine festival or event. Because the event has limited tickets, it does sell out quickly. People look forward to attending the Block Party every year because of its inviting and friendly atmosphere. And everything is included in the ticket price so there’s no worry about if you can try another wine or enjoy another oyster. Dinner at this year’s Summer Block Party is provided by Paso Catering. The menu includes tri-tip and barbequed oysters, and you’re welcome to sit down and enjoy dinner and conversation. Music, and dancing if you’re moved to move, is by Burning James and the Funky Flames. Founded by James Scoolis 10 years ago, the band has played hundreds of shows along the West Coast with their high energy funk, sweet soul, and horns with a sound that gets people dancing. 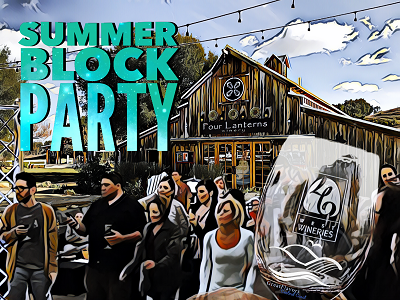 The Summer Block Party is 6:30-9:00 pm on Saturday, July 7, at Four Lanterns Winery, 2485 West Hwy 46.